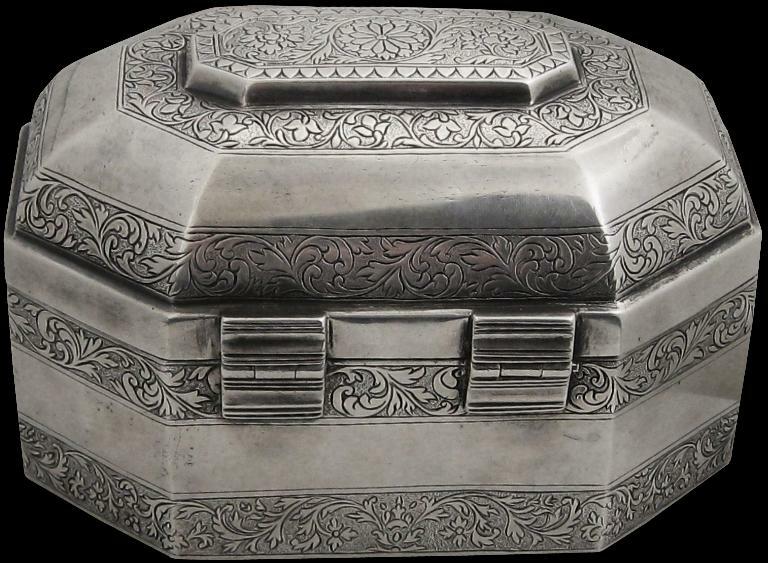 This silver box is finely chased with scrolling foliage and floral borders in the Mughal style. The hinged lid is lockable – a small silver lock is present although the key no longer is. 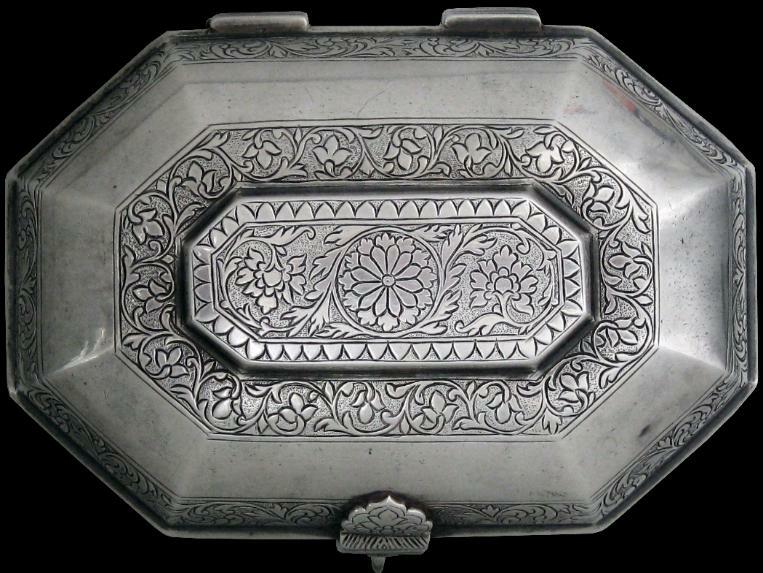 The convex lid rises architecturally to a flattened, raised lozenge which also is engraved but with Ottoman-influenced stylised carnation heads and foliage within a petal border. loth unit of measurement whereby refined silver is equivalent to 16 lothige and silver accorded a mark of ’13’ has a purity of 13/16 or .8125. Several assay offices in the Austro-Hungarian empire used the fleur-de-lys as an identifying symbol during the late 18th and early 19th centuries. The engraving is sharp and crisp but the contours of the box are softened. It is possible that this box is 18th century and that it was brought to the UK early on and was kept hidden away almost ever since. The style is certainly eighteenth century Mughal. This is a common issue with items sourced from within the UK. Many were acquired close to their time of manufacture during the colonial period, brought to the UK shortly thereafter, and have been kept as keepsakes and not used ever since. It means that whilst they have significant age, they do not have significant wear or loss. The small handmade silver lock is in the classical Indian style. 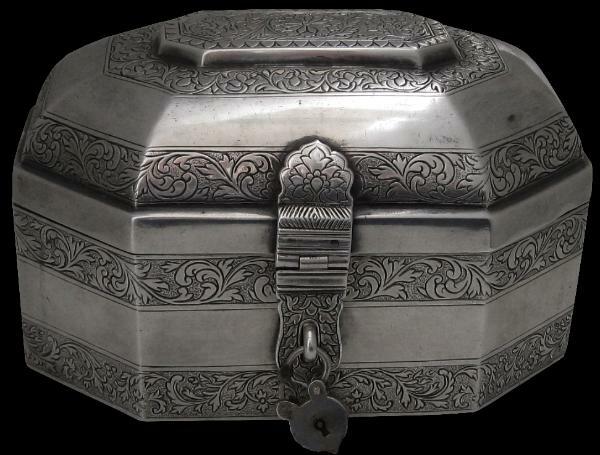 Silver boxes of this type were used in wealthy Muslim Indian households in the eighteenth and nineteenth centuries to store jewellery, or small quantities of coins needed during the day, or sometimes tobacco and betel. The small lock allowed the contents to be kept safe from minor pilferage by household servants. Acquired on the UK art market. A similar example (but without the engraving) is illustrated in Terlinden, C., Mughal Silver Magnificence, Antalga, 1987, p. 154; and Tardy, International Hallmarks on Silver, 2000.